The cost of dewatering paper. Vooner Paper Machinery offers dewatering solutions for paper mills. Dewatering fabric on a paper machine consumes energy to physically remove particles of water. If the vacuum pump is worn and airflow is down to 60% of original, energy and pump seal water is wasted and the white water must be removed thermally from the paper with steam in the dryer section to thermally vaporize the moisture at a much higher use of BTU energy / pound of water removed than used by vacuum pumps. Vooner Paper Machinery is a design and manufacturing company of paper and fabric dewatering equipment for paper machines. In 1981, the foundation of VPM was developed to provide rugged vacuum boxes and oscillating showers to clean the newer technology man-made fiber paper machine fabrics. Vooner FloGard® Corporation acquired the core of VPM in 2003 from Nash Elmo. VPM provides a system approach to paper machine fabric conditioning to dewater paper to include the power of Vooner liquid ring vacuum pumps. To insure economic performance Vooner Paper Machinery, VPM, offers performance testing of dewatering equipment such as vacuum boxes, showers, piping and vacuum pumps. VPM uses the orifice plate method for measuring actual airflow at vacuum levels for a pump. The performance test results are put into a report which shows the total wasted energy and seal water included in the life time cost of ownership. From this report Vooner’s engineering staff is available to propose new improved vacuum pump with return of investment ROI for a new pump.. VPM relies on the TAPPI TIPs for recommended size vacuum system equipment. When a paper mill purchases a new stainless steel rotor and cones pump and eliminate the tested loss of paper machine steam in the dryer section, Vooner will send X% of that energy saving to the Tennessee Low Income Home Energy Assistance Program (LIHEAP). VPM will recognize the paper mill’s saving of energy on their paper machine and pass that saving to people of Tennessee who need assistance in purchasing energy for lights in their homes. The diagram below shows the Vooner paper machine components for dewatering in the press section.The captions describe the functions of the components. Crockett Suction Boxes™. Vooner designs and builds Crockett suction boxes for your current machine conditions. Vooner’s suction/uhle boxes mount horizontally, vertically, or even upside down. Strips and Covers for Vacuum box slots. VPM uses TAPPI TIP 0404-27, page 2, to determine a recommended slot width related to machine speed and dwell time. For narrow slot widths, the “Felt Saver™” strips are manufactured by VPM. For wider slot widths, to avoid damaging fabrics, the “Seam Saver™” box cover, with patented design opening is manufactured by VPM. For longer life, Silicon carbide insert can be supplied in the Seam Saver. “Complete Coverage Cleaning™” of the felts is delivered from Shenandoah™ actuated showers, with automated or manual brush cleaning. As the animation shows, the mathematical concept equates the shower cross direction stroke length to cover the exact length of fabric in one revolution. In that fabric revolution, every part of the fabric is sprayed by the needle spray from one nozzle. Lubrication showers on Vacuum boxes Fabric passing over the slot of a vacuum box needs to be lubricated with water to make a tight seal to the strips or cover of the slot for better dewatering. If the contact by the fabric to the box strips is dry, the fabric or strips or cover will wear will quicker than a water lubricated contact. A VPM Crockett Box lubricating shower will supply a fine spray of water to lubricate the fabric and wear strips and extend their useful life. If the fan nozzles have a tendency to clog from paper fibers in the shower water (see VPM Osprey Strainer) then adding an oscillator will spread the lack of lubricating over a wider zone on the Crockett Box and improve the td the lack of lubricating over a wider zone on the Crockett Box and improve the tendency to have MD streaks or breaks. Nozzles. Vooner provides shower spray nozzles for VPM Shenandoah showers or replacement nozzles for showers designed by other companies. The needle nozzle sends a single high force stream to penetrate the fabric to dislodge paper fibers that became imbedded in the fabric. The fan spray nozzle used to lubricate strips on a vacuum box sends a broad wide spray into the fabric as it approaches the vacuum box strips. This is often fixed, but would produce more complete lubrication if were also oscillated to avoid machine direction streaks from clogged nozzles. 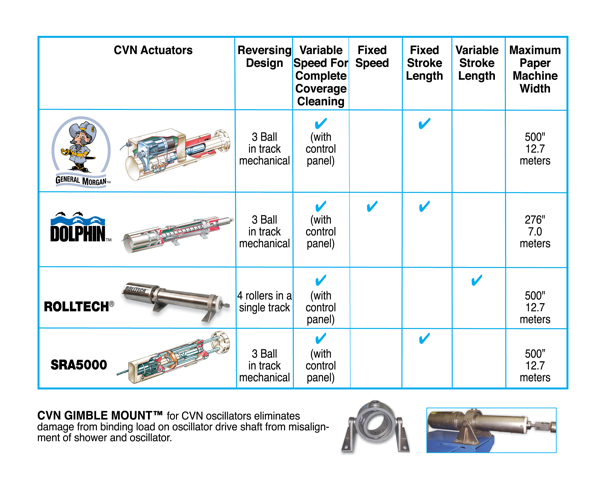 VPM provides a “Real easy clean” nozzle with a special design for “brush cleaning,” see below. Call VPM or email, “Mr. Nozzlehead” for other recommendations.s of wire cleaning stationary and actuated showers.As paper machines are running faster than original and mills have changed grades from original, the size of dewatering equipment maybe too small. VPM can evaluate potential wrong sizing and recommend multiple improvements for the future.Years of experience and many custom designs enable Vooner’s VPM team to evaluate mill equipment, apply new production goals and recommend new equipment with fast return on investment. Brush nozzle cleaning inside showers. If processed white water is used for shower water there will always be a small amount of fibers remaining that could eventually clog a nozzle. This risk can be overcome with the use of a rotating brush inside the shower. These stainless steel rotating brush rod inside the shower is automated to rotate at specified intervals. If the brush rod does not rotate for too long a period of time, fibers will accumulate over time to a build-up of fibers that will not be removed by the brushes. Manual turning can be supplied as an optional deduct, but the danger of not turning regularly carries the risk of developing the “build up” that is difficult to be removed. Separators of vacuum process water, barometric drop legs and unloader pumps. Vooner inlet separators provide vacuum pump protection from process liquid carry-over. By removing the process liquids prior to the vacuum pump, erosion and corrosion is reduced and stable vacuum levels are maintained.To remove the separated white water from the vacuum pump inlet separator, which is under vacuum, two methods can be used. The older simpler design is the barometric drop leg. This requires enough vertical height for the drop leg pipe which is calculated to be 1.13 feet per inch of mercury vacuum in the inlet separator. If this vertical height is not available, then a low NPSH “unloader pump” can be used. Vooner’s unloader pump mounts directly into the side of the inlet separator. Weir tanks. The easiest and simplest way to measure white water removed from the paper or fabric while the paper machine is running is to use a weir tank. A simple “V” notch inside the tank is visible to read on a side scale the water flow in gallons per minute, gpm. Vooner manufactures a weir tank based on mill flows to be measured and available floor space. VPM is capable of designing the shape and user friendly visible “V” notch for easy reading. Gravity Strainer of paper fibers from white water. If the process white water is recycled to be clean shower water VPM offers the OSPREY™ gravity strainer system that includes the VPM OSPREY™ gravity strainer. As an osprey bird snatches fish from a river, the VPM OSPREY™ gravity strainer take fibers out of white water. The all stainless steel OSPREY™ gravity strainer can remove fibers longer than 70-140 micron depending on the nozzle opening diameter used in most showers. The patented design of the OSPREY provides vertical spray streams upward through the wire mesh screen sending separated fibers into a collection box for removal and continual self-cleaning. There is no need to stop the OSPREY strainer and steam spray the mesh screen upward to clean the screen from the inside bottom as in other designs on the market. High Pressure Shower Water Pump. Stand-alone pump packages are available to deliver pumps in the ranges of 400psi for high pressure nozzle cleaning showers and 200psi for low pressure fan nozzle lubrication showers depending on application. Liquid Ring Cone Ports Vacuum Pump. Vooner started supplying pumps to paper mills in the US after its first participation in the TAPPI exhibition of 1986. Vooner has participated in this exhibition every year since. From 1986 to 2003 Vooner focused on improving the performance of paper mill vacuum pumps with the introduction of the orifice testing of airflow at vacuum and the introduction of rotors and cones being stainless steel to retain performance longer. In 1994 Vooner introduced its patent of Removable Bearing Carriers, to allow maintenance to change bearings with the pump in its place which is a significant cost saving.In 2003 Vooner acquired the products and production facility of CVN Systems, Greeneville, TN from Nash. In 2010, Vooner moved to a newer 54,000 sq. ft. manufacturing facility in Greeneville and acquired a significant amount of fabrication, welding and machining equipment to expand the supply of strategic paper making equipment to the world.VPM discharge separator-silencers provide up to 99% air/water separation while significantly reducing the noise output from the vacuum pump. VPM silencers are available in carbon steel, 304 and 316 stainless steels.